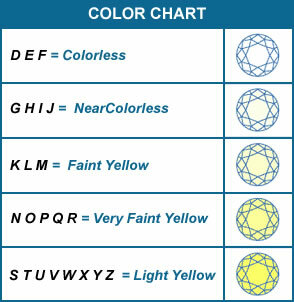 Color : describes the amount of color the diamond contains. This can range from colorless to yellow with slight tints of yellow, gray or brown. Colors can also range from intense yellow to brown, blue, green, pink and red. These fancy colors are rare and therefore more valuable. Cut : refers to the proportions, finish, symmetry, and polish of the diamond. These factors determine the fire and brilliance of a diamond. Well cut diamonds sell at a premium and poorly cut diamonds sell at discounted prices. Carat : is the unit of weight for the diamond. A carat is further subdivided in 100 points ( 0.01 carat = l point ). One carat is equal to 0.20 grams. Value per carat increases with carat size, because larger rough diamonds occur less frequently. In other words, 2 half-carat diamonds taken together will not cost as much as 1 one-carat diamond, as the one-carat stone is more rare.